One of the nice things about living in a "Small Town" is that things eventually get made right. Diane Cline, a woman who I was privileged to know from my own civic work, passed a few months back. To say that the central business district of Wilton Manors, the Wilton Drive, looks the way it does because of her and her efforts is a serious understatement. 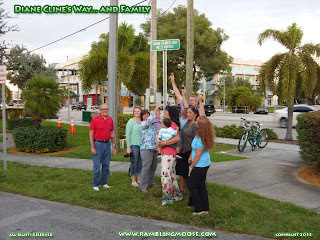 She was the driving force behind the modernization of the entire district from the two lanes with parking it once was, to the widening and refurbishment of the current five lanes, the addition of improvements and other factors that make modern Wilton Manors what it is. Recognizing the need for correcting the Car Culture of South Florida, she led the effort to reduce the Drive to two lanes via our own Wilton Manors Development Alliance, then the Wilton Manors Main Street. The Two Lane Initiative is the idea that we should turn Wilton Manors into an even more walkable city than it currently is by limiting the Drive down to two lanes and increase parking so that the businesses can thrive - it's a win-win for everyone once it gets done. It would also raise the property values of town, make it easier to cross the streets, and reduce the carnage that happens when people expect drivers in South Florida to follow the Uniform Vehicle Code by allowing pedestrians the right of way. Diane understood this as a fundamental human right and worked tirelessly to allow this to move forward. Her pet projects were many and historic, such as the Wilton Manors Historical Society, and the Wilton Manors Women's Club. If you didn't know Diane, you probably didn't know how Wilton Manors worked and how it came to be. She used to say that Wilton Drive should have been called "Diane's Way", a clear double entendre to those who knew her. But either way you read that, it was correct. It simply wouldn't be what it is without the efforts of this amazing woman. Last night we gathered, Family, Friends, and the rest, at the little park in the middle of town, Jaycee Park to honor Diane with a get together. There at the park, we saw the growing Children's Art Project that was just expanded to include the bricks that form a small plaza in front of the Post Card through Diane's efforts with the Wilton Manors Development Alliance and the Wilton Manors Historical Society. The Jaycee Park improvements are there because of Diane's and others civic efforts, and it was across the street from the heart of the city near Hagen Park, the Women's Club, and "New" City Hall. At least it's "New" to me since I'm one of the long-time new-comers. Newish? Not sure. Never mind that, I'm rambling. There's a little street behind the Jaycee Park and Children's Art Project. NE 5th Street. To rename Wilton Drive might have brought a twinkle to Diane's eye but it would have been a bit confusing to all the businesses. So instead of renaming that, NE 5th behind that park will now have another name. Diane Cline's Way. A nod to all of her works through her long and productive life. We got to see the unveiling of the signs by the family, and the commissioners, and had a chance to visit with friends. One of the nicer things about living in a small town. Sure you get to know everyone, for better or worse, but when you get together, it's always worth the time. 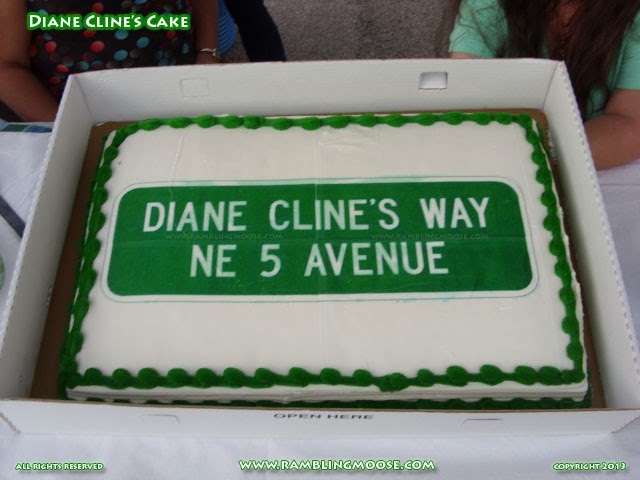 We got to stand in the middle of Diane's Way, talking about her good deeds, and having her cake. Diane did have a sweet tooth so she would have enjoyed some of that cake. I know I did, I would have loved a second piece! If anyone reading this would like to be a part of getting the Children's Art Project finished, you can sponsor a brick. Just follow through this link to the page on the Wilton Manors Development Alliance's page for the artist's drawing of the Children's Art Project where you can see what will be when it is complete. I promise you, I'll keep an eye on them while I'm able. Diane would have liked it that way.